Hey there friends! I hope this Monday morning finds you all well! Unless you have been living under a rock I know by now you know we are 1 day away from the release of SPIDER-MAN: INTO THE SPIDER-VERSE. As it swings onto 4K Ultra HD Combo Pack, Blu-ray Combo Pack, and DVD on March 19 from Sony Pictures Home Entertainment and Sony Pictures Animation. If you didn't see it with it was in theaters now is your chance to bring it home. We were lucky and received an advanced copy for our viewing pleaser and have already watched it no less than 5 times. 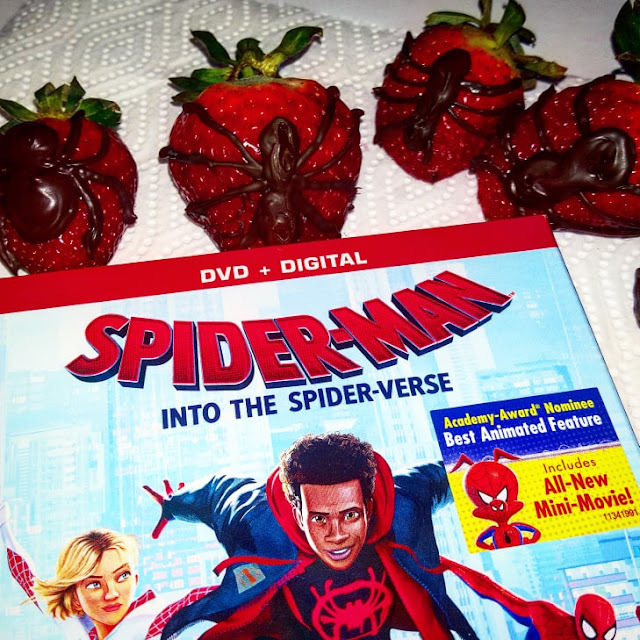 To go along with our viewing party I decided to make these yummy Spider-Man: Into the Spider-Verse Chocolate Strawberries. They are very easy to make and ho doesn't love chocolate and strawberries! Wash and allow strawberries to thoroughly dry. Water will cause the chocolate to seize up. since you are not fully dipping these berries it's not as big of a deal but it is a good rule to remember. 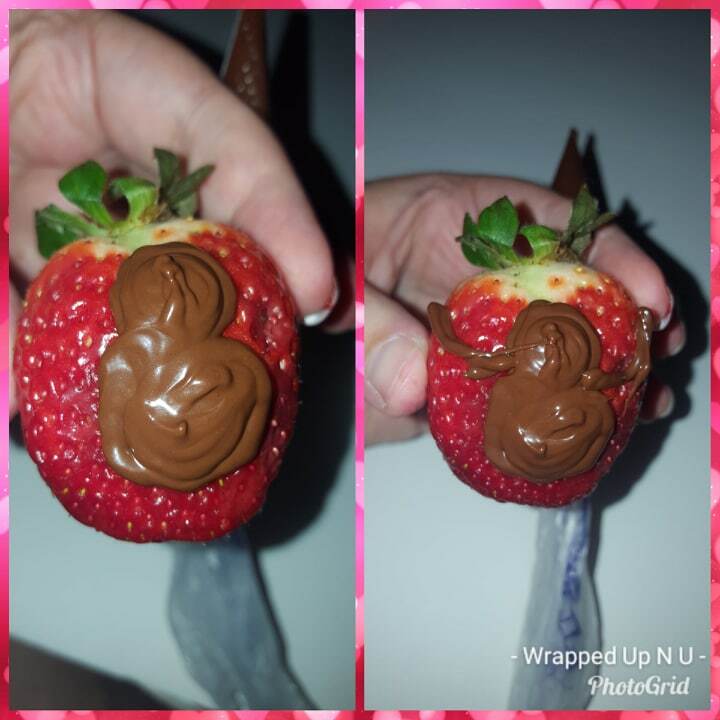 Also if your berries have been refrigerated you will want them to warm to room temperature so they will not sweat causing the chocolate not to stick or slip off. Place chocolate in microwave-safe bowl and microwave in 30-second increments. Stir chocolate each time to prevent burning. To thin chocolate, you can add a SMALL amount of shorting to it while melting. Add chocolate to your bag. Either make a figure 8 or 2 roundish circles for the spider head and body. You want to make them think and wide since you will no be fully covering the strawberries in chocolate and want the spider to stand out. Now branch out with 8 arachnid legs, follow the flow of the strawberry so the legs look as if they are grasping the berries and wrapping around. Let the chocolate cool or harden then enjoy! Don't forget to pick up your copy of Spider-Man: Into the Spider-Verse or check out our giveaway to win your very own movie swag! I love the look of these. Super cool and I am sure that they taste amazing too. 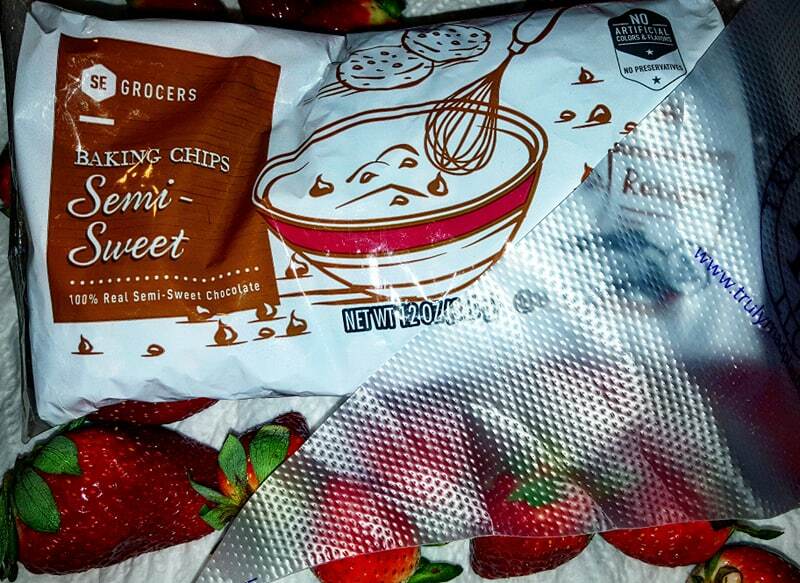 Your strawberries are super adorable. This is a fun little project for in the kitchen before a movie night with the family! 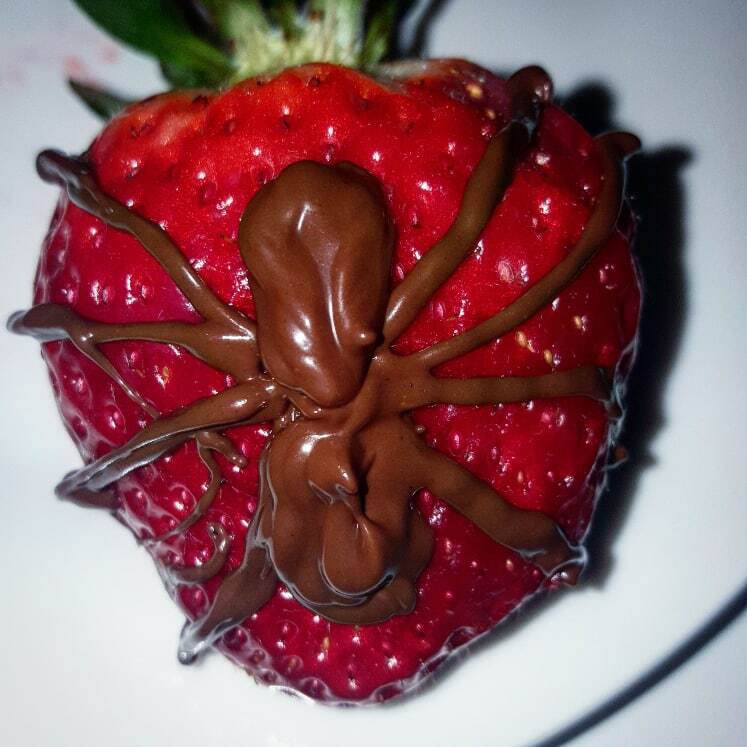 I love chocolate strawberries, and these spider strawberries are super creative and clever. It's perfect to eat while watching this movie. These spiders �� are very imaginative! We love chocolate covered strawberries ��They are an easy delicious dessert. So are these strawberry spiders. I have shared this little appetizer on Facebook and Pinterest. Thank you for sharing! Wow these look yummy and easy to make. These are adorable and look so easy to make. My family would love them...and they'd be fun for a family movie night. I think they look so yummy! I'm excited because I love action movies. I have never seen a Spiderman movie before so, if I win, this will be an adventure for me. Thanks for running this sweepstakes. These look so delcious, and they would be super fun to make with my kids.